A bit of an "aside." I've had the unpleasant experience of listening to several heated discussions on Facebook about lead safety. I've had multiple intelligent friends speak to me about concerns about their glasswork and non-glass friends worried about my health and safety. I am impressionable when it comes to medical matters, so a heated discussion on a wonderful Facebook group for glass artists left me a bit paranoid. At the time I spent a bit of money to build a better ventilation system, researched lead safety extensively, and discussed it with everyone I knew. I had been made to believe, however briefly, that my love of glass was killing all of my loved ones who set foot in my house. Not happening. Today's post is going to cover some lead safety "Fact or Crap" items. The big Fact: The significant threat is ingestion, not inhalation. Think of lead much like water. Is ice contributing to the humidity of your air (are you inhaling it?) Yes, technically. A tiny portion of the ice can sublimate straight into water vapor. But it's so little it's insignificant. Is liquid water sitting in a glass adding to your humidity? Yes, very slowly. If you want to raise the humidity in a room, how do you do it? A pot of boiling water works much better. Lead is little different... actually, MORE difficult than water. 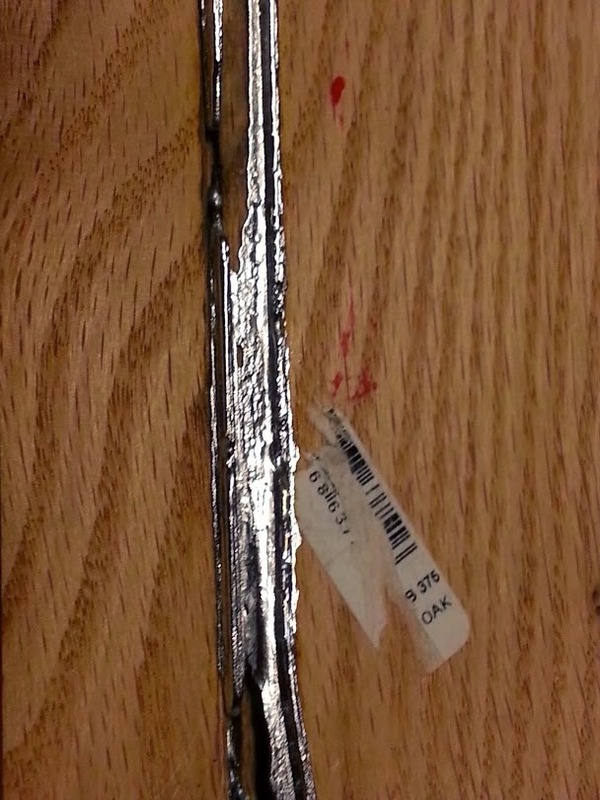 Lead melts at 621.43 (°F). At that point it's equivalent to liquid water (as far as our inhalation of it). Lead doesn't boil until 3180 °F. We are quickly melting it and it cools and resolidifies. You aren't at a risk of inhaling lead fumes unless you are smelting it. If you solder and you see fumes/smoke fly in the air that is not solder, that is flux. Flux is often resin based (check your bottle and your MSDS) and/or a chemical formula that will not poison you. You CAN irritate your sinuses and lungs, and cough for a day or two (at least the brand I use, Old Masters, can't poison me unless I confuse it's blue color for Romulan Ale and take a swig). Now, as you work on it you get it all over your hands. That's why you must wash your hands immediately after working. You want to get lead poisoning, lick your fingers. I've cast lead into cames now, it didn't generate fumes (and incidentally my stovetop could barely melt the lead). Some of us paint, and we use lead-based paints. Like a lampworker or glassblower using frit/powder, it is more of a concern. However, the powdered pigment isn't like flour and so on. It's a "heavy" powder, filled with glass fluxes and heavy minerals. While it is a powder, I've noticed minimal "floating dust" when I opened the sealed jar. I take a palette knife's worth and put on a palette with no noticeable cloud. Of course then we promptly mix it with binders and mediums and such and it's never again in dust form. I do own a mask that I can wear if I am concerned (and I use it for my silver stain mixes, which DO like to make dust clouds). Otherwise... as rare as I actually mix a fresh batch of paint... it's not a serious concern for me. Now, for three "real world" arguments. The owner of the local glass shop, a woman who is as generous with her knowledge as she is skilled at a workbench, discussed lead safety with me a few months ago after a Facebook thread made me panicky and I bought ducting to build a ventilation rig. She informed me that in 30+ years of doing stained glass she has occasionally had a blood lead level test run, and it has never shown anything abnormal. In the aforementioned FB thread, the owner of a professional studio mentioned she had an employee once who did test for elevated lead. Turned out he hadn't been changing out of his work clothes at work, and had been driving home in them after being around soldering and lead 8 hours a day. THAT lead to an "elevated" level of blood lead! Not lead poisoning. So, in an effort to maybe put this to bed, both for others and for my own paranoia, I just went to the hardware store three hours ago and bought a big pack of lead tests. Instant Lead Testing ("If it's red, There's lead!" it says. "If it's red, you dead!" I thought) by Lead Check. A pack of plastic tubes with two ampules you crush to mix the solution. You then apply it to surfaces and If It's Red(tm) You're gonna have a bad time, mmkay? Test 1 - My computer desk. I do my pattern work on my computer and have been known to absentmindedly click print while working on glass. Oh, I also eat here and spend 10-16 hours a day near this desk. You can imagine why it was site number 1. I dumped yellow testing liquid all over the desk, several important keys, and the left button of my mouse. Not a hint of red. Test 2 - Other common surfaces in my house. After all, as some people keep trying to say to us, lead vapors are floating around to kill us and everyone we love. My couch? Nope. My dining room table? Nope. If you are unfamiliar with my home, it's an open floor plan, no walls. Couch armrest, kitchen counter, all ok.
Test 3 - What the heck, is this thing on? 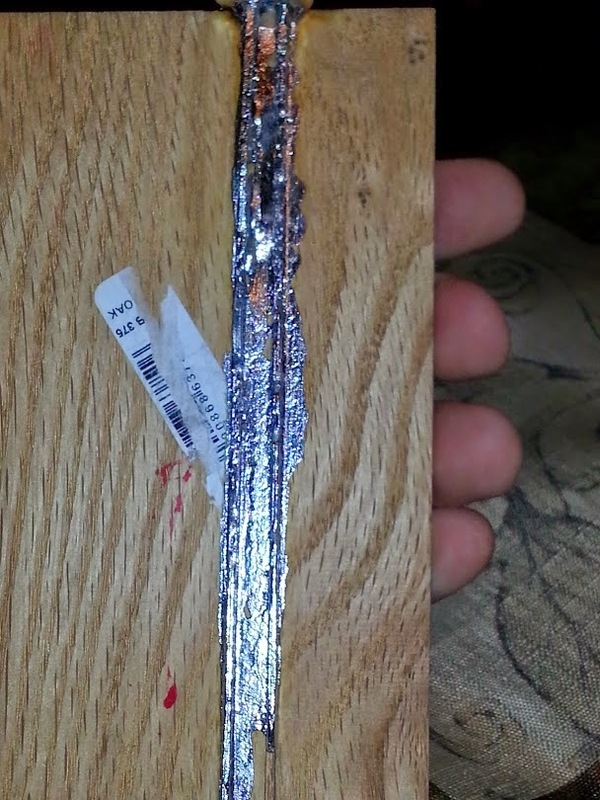 Solder and my (paint-encrusted) palette knife. Both came back brilliant dark red (oddly the solder took several seconds and the palette knife's droplets turned red practically as soon as I thought about applying). I guess they work! Test 4 - My workbench. I tried the surface of my primary work bench. Yellow! Test 5 - The plastic top of my lightbox. Tried several spots, all yellow! Test 6 - The side of a plastic storage thing bordering my solder area. Yellow! This is about 1' from my soldering area. Test 7 - The wall bordering my solder area. Permanent yellow staining of the paint, a foot from my soldering area. Test 8 - The steel coil holder for my soldering iron, less than 1" away from the hot tip of the iron when it's on. YELLOW. Test 9 - Dragging the thing through every cranny and coil above the soldering iron in that holder. FINALLY got some pink.... at the opening of the holder, which I hit every time I put the iron away without looking right at it. I guess that makes sense. 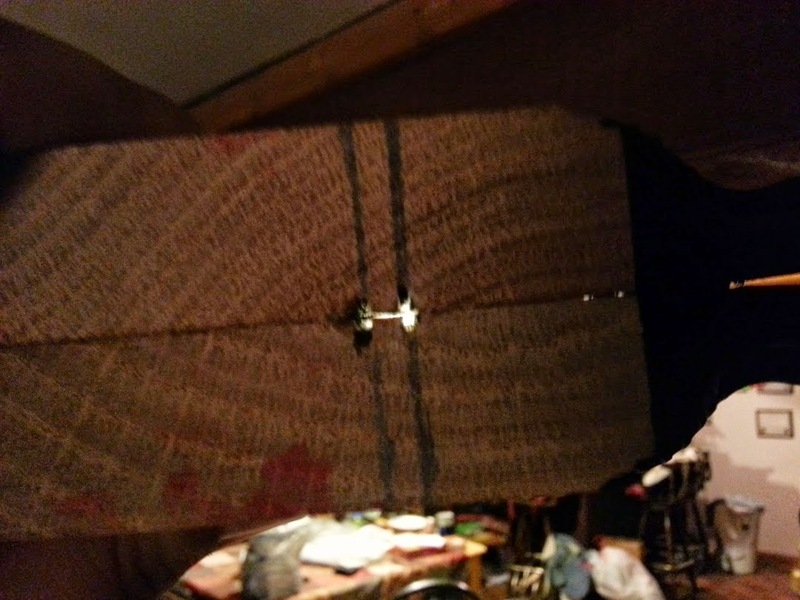 Edit: Test 10 - Tested the ceiling above my soldering area in several spots on a 2' line above the bench. YELLOW. So, in short: Don't smelt lead from ore, don't lick your fingers, don't confuse your gin and tonic with your flux and wash your hands, kids! My last planned obstacle: casting lead cames to use. I've been trying to get a mold to work for a while now. Soapstone would be much easier, I think, but the documentation I have is after the period of my panel. The documentation I have from before it says the molds should be either iron or wood. There is no way I can forge an iron came mold, so wood it is. A quick note on terminology, as I was taught and use. The two broader surfaces of the came's "H" that are visible are leaves. The lead portion connecting them, which is directly between the pieces of class and cannot be seen, is the heart. A less quick note on safety: Lead (and other heavy-metal) poisoning almost always happens because of ingestion, not inhalation. If you get a whiff of fumes while soldering and it irritates your nose or gives you a headache, it's because of the flux compounds (which generally are not serious, but check the MSDS for your flux). Think of lead like water. If you have a cup of water, is it billowing steam in your face? No, it's in liquid form. Even if you heat the water a bit, its warm or hot water. It is quite possible to heat lead and not generate lead fumes. If you are boiling the lead, then you have a problem! At the hottest setting of my stovetop I could barely melt the lead. Still, I ran the vent hood on high. I believe this process is very analogous to soldering (which is melting lead), and soldering is pretty safe for a hobbyist. I know professionals with decades of stained glass experience who do not have elevated blood lead levels. A little research indicates that the temperature at which lead generates fumes is 800-1000 degrees hotter than the melting temperature during casting. That being said, a hot plate outside will not do you wrong, either. Remember that any tool or container you use for working with lead is contaminated and must be washed. 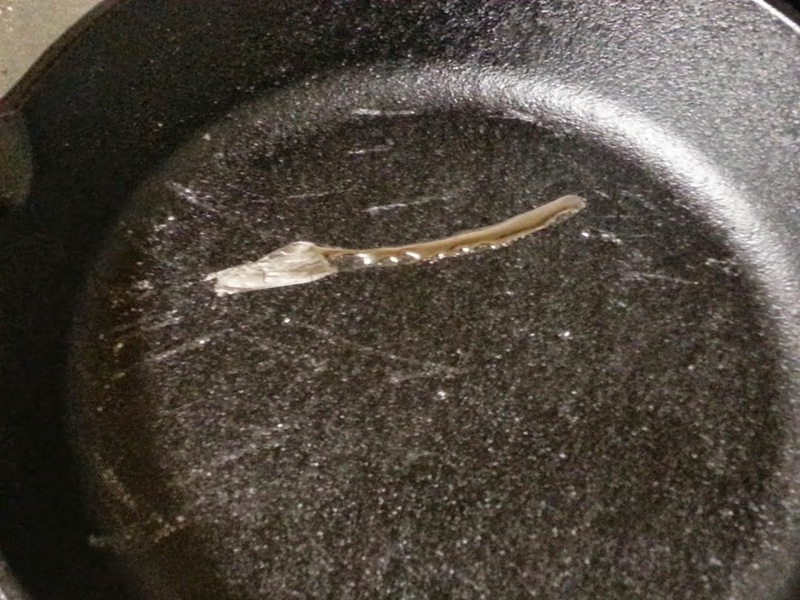 If, like me, you use a pan on the stove do not reuse the pan for food. I highly doubt you could get it clean enough. 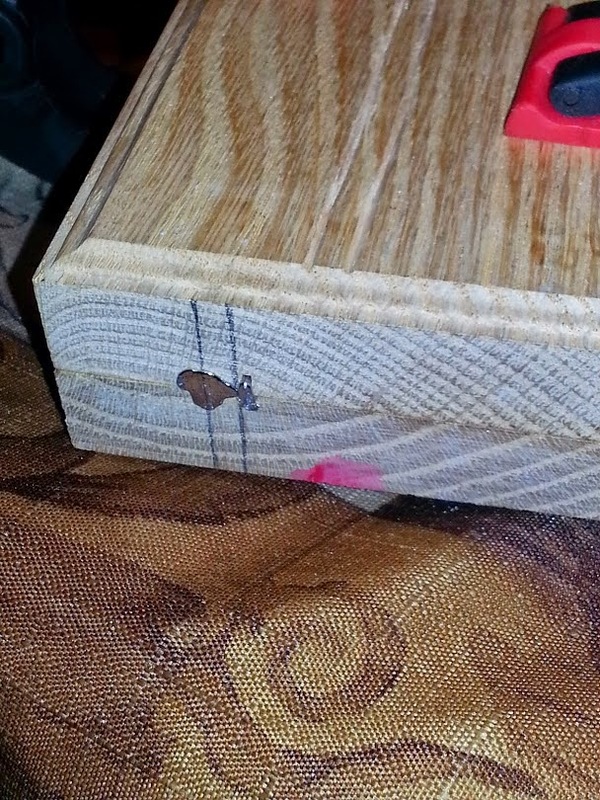 I started with some wooden blocks that I believe are intended as part of crown molding. 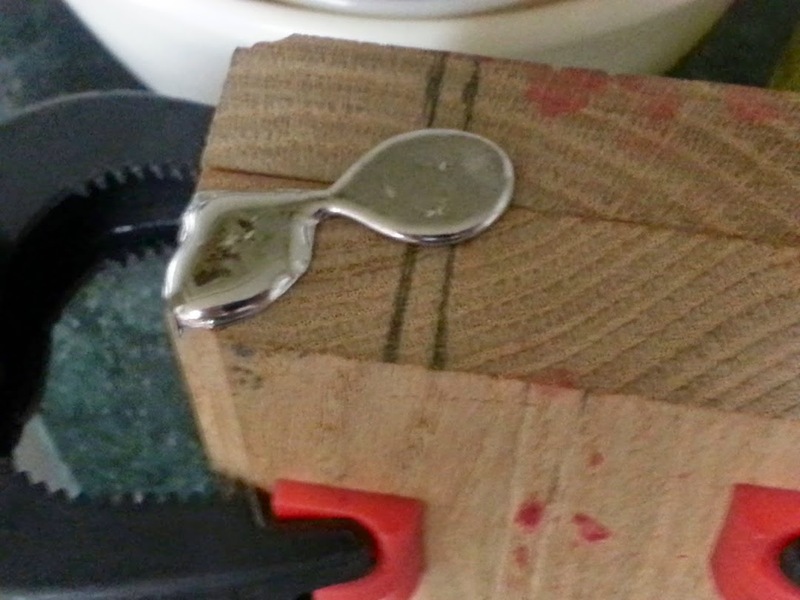 At the hardware store I verified they were relatively flush when squeezed together (such as by a clamp). At first I tried free-hand carving the grooves. That sort of worked but I realized it was going to be impossible to keep them lined up the whole length without the leaf-grooves being wider than I wanted. Going back to primary sources provided an answer. Soaking string in paint, laying them out, and then pressing the other board onto the first. This would create two sets of lines that should line up again. I found this to be fairly difficult, however, because I was trying to keep the lines a uniform distance, and the thick yarn made a fairly imprecise line to then follow. Not to mention it rolled a bit when I was trying to line up the edges of the block too (probably unnecessary). 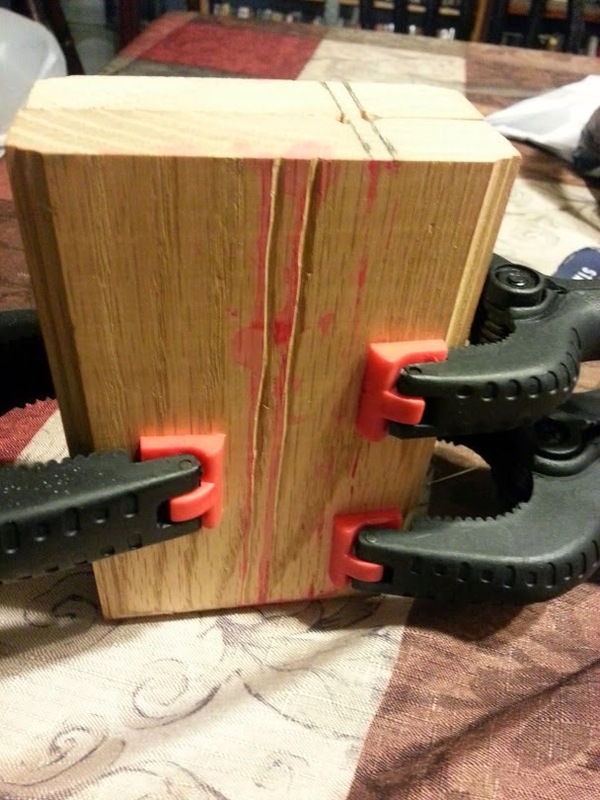 This view of the clamped mold shows the difficulty I had with the period method. I ended up using a precise rule and measuring in an inch from the edge of the block. I made a line, moved over about 3/8" and made another line. The idea was to provide a common reference point (the block edge) and, if my measurements were accurate, everything should line up. I then used a handsaw to "connect" the lines on either end. This ended up more difficult than I initially anticipated because of the wood I used. 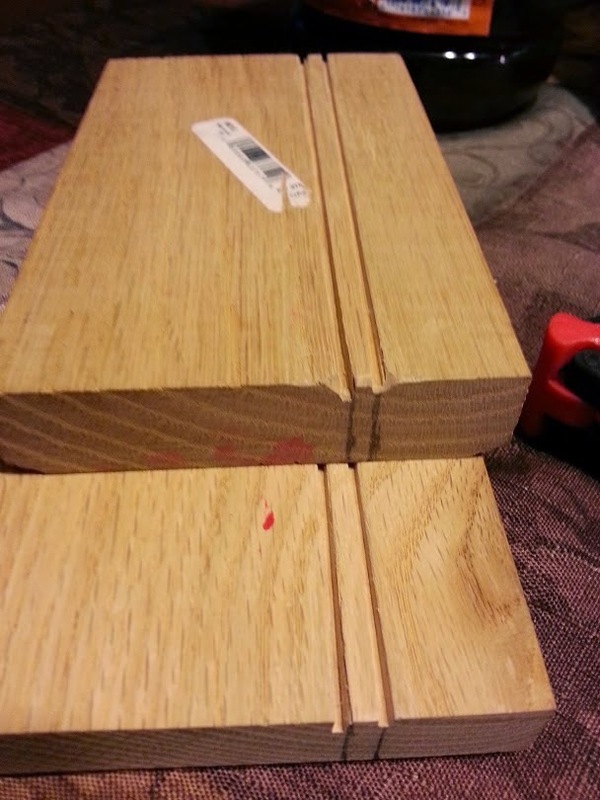 It has a slight curve, so sawing the ends was easy but it took some patience to get the grooves in the center. 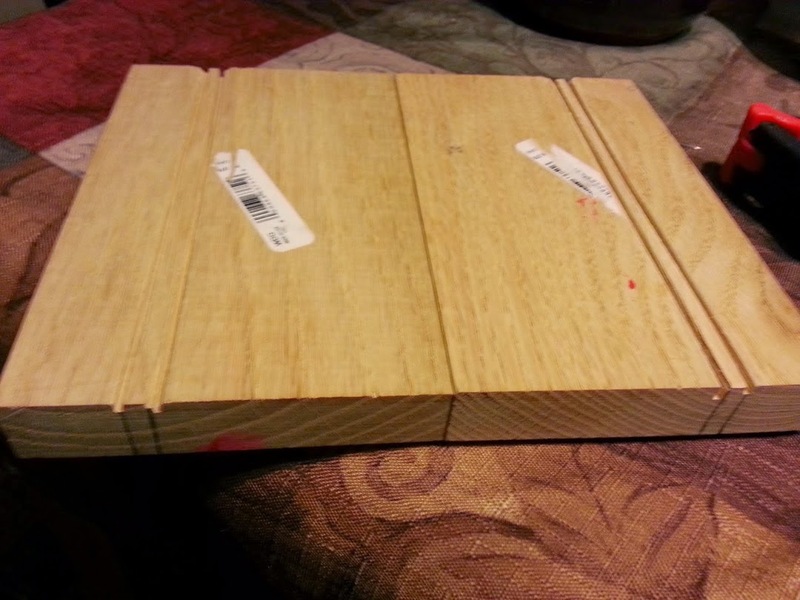 The boards after the grooves were sawn. I had a mold for the leaves, but I needed to remove a little of the wood between the two grooves to put the heart between them. I tried several tools and didn't find an "easy" one to make this painless. First I tried wood carving chisels, which did almost nothing (they are a cheap set). Then I tried the thin edge of a large file, with minimal results. I then wrapped sandpaper around that thin edge and tried again with some progress. The only sandpaper I had available was relatively fine, however, so I think that impacted it. When my former protege-brother (he was elevated, there was no falling out) taught me to cast with lead-free pewter, he taught me to use an electric crucible popular with sportsmen for making lead sinks. Another protege-brother had said that a cast iron skillet works just as well in a pinch. I purchased a cast iron skillet with nice little pour spouts for this purpose (If anyone comes over for breakfast I promise not to reuse it!). I placed a bit of scrap came into it and fired it up. And waited. And waited. Eventually, with the fire turned up as high as it would go without the igniter clicking, it worked. 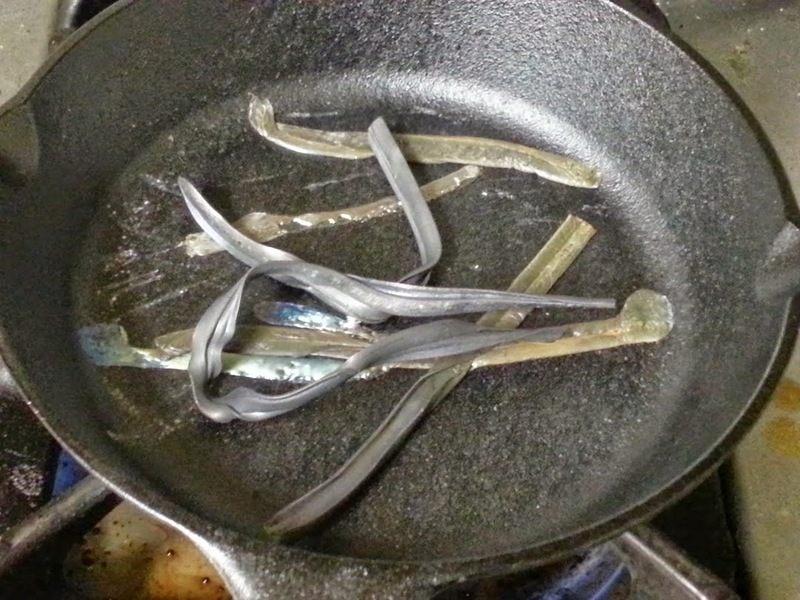 As soon as I tipped the pan a little a lot of the above lead pooled together. The impurities are fairly visible and many "colors" appeared as time went on. I couldn't take pictures of the actual pouring because at this point I required speed, accuracy, and two hands. The top of my mold with some over-flow. It took less lead to fill it than I anticipated. The bottom of the mold. I had set it on a block of soapstone so as to protect the surface of my stove from molten lead. Prying the mold halves apart was often a bit of work, and the first time it required an implement or two to assist. The results were somewhat ugly, though identifiable to me. The pictures may be hard to see because of how shiny the came was. It washed out the "depth" I think. 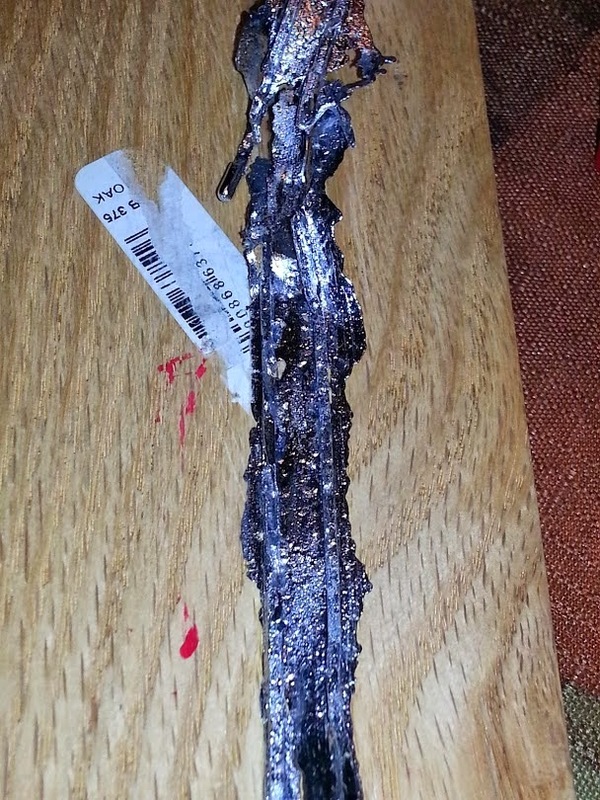 I immediately remelted the lead and tried again. I know that slight alignment changes can have big effects. Much more identifiable. The heart did not fill in near the top, but there was a usable portion from this casting. I figured the mold might "burn in" a little and remelted this again. This was my third or fourth attempt. I need to call it a night, so I've stopped here for the moment. Each casting has turned out better results than the one before it. I kept the came above, there is a section about 2" long that is usable, and I have 1" square pieces that will gladly take this piece of came! It's not much, but it's a successfully cast came from a wooden mold.